Have you heard of the seven wonders of the world? The Greeks compiled them as the most outstanding sights around the globe. In the years since these wonders were established, many of them have ceased to exist, with the Great Pyramid of Giza the last monument still standing. Luckily, we have some new sights worth seeing that represent the modern age. With the world constantly changing, it was about time we updated the list anyway. If you take a vacation to Rome, there’s a good chance you’ll see the Colosseum during your stay. It’s one of the most impressive architectural structures around, even if it’s in a slight state of ruin. Back in its heyday, 50,000 people would sit in the Colosseum to watch the gladiators fight, something that you wouldn’t catch happening there now. While it might not serve the same purpose anymore, though, it’s still a huge inspiration to the design of other amphitheaters around the world. Despite being around since the 1400s, it’s only in the last hundred years or so that locals and tourists have explored the citadel of Machu Picchu. Its location in the Andean mountain range has secluded the spot from the public eye, and also made it difficult to visit. While it might require a bit of effort to get to, though, the trip is more than worth it. You’re not just seeing one structure here but the work of an entire civilization. The granite used to construct their buildings is quite a sight to behold too. It’s the structure that comes to most people’s minds when they think of India. Commissioned by Shah Jahan as a tomb for his wife Mumtaz Mahal, the marvelous structure borrows from a variety of different architectural styles, including Turkish and Islamic. Despite being a mausoleum, there’s a lot of beauty to this building that can only be appreciated up close and personal. That’s why millions of people visit Uttar Pradesh to see the sight for themselves every year. The Mayans may not have successfully predicted doomsday back in 2012, but they still have a lot going for them. Their architecture is some of the most compelling around, especially when you see the structures in Chichen Itza. This Mexican city utilizes various architectural styles, potentially because of the diverse population that inhabited Chichen Itza, and is notable for the presence of El Castillo. This pyramidal temple is found at the center of the city and is a structure that many now associate with the Mayan culture. Having potentially been around since 9000 BC, Petra is one of the oldest wonders on this list. Established as the capital of the Nabataean Kingdom in the 4th century BC, the Arabian city was famed for its use of water technology that allowed locals to create something of a mini oasis. Out of the rocks have come some of the most impressive structures you’ll ever see, including a monastery and amphitheater that carved with incredible detail. No wonder tourism numbers are starting to increase year on year. It’s hard to miss the Christ the Redeemer statue if you’re in Brazil. 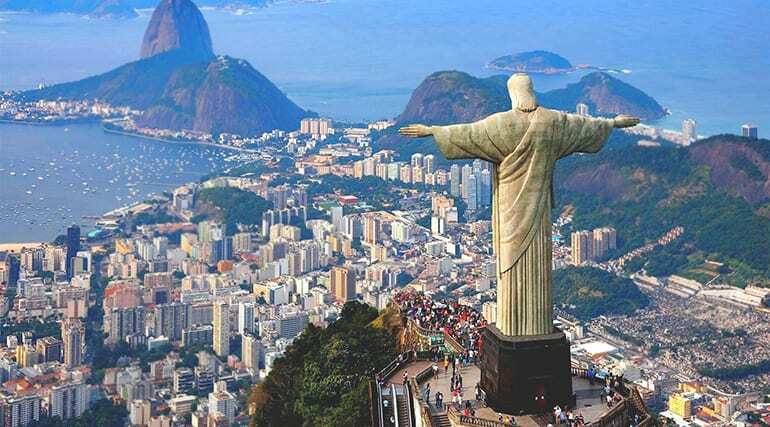 The 130-foot monument towers over the city of Rio de Janeiro and has become a symbol of Christianity all around the world. It was first built in 1931, thanks to the generous donations of many locals and has stood firm ever since. It requires maintenance work on a relatively regular basis, due to its exposure to erosion, but that doesn’t make it any less of a wonder to behold. Seeing it up close is worth the climb up Corcovado mountain. As the longest manmade structure in the world, it shouldn’t be surprising that the Great Wall of China is one of the sights you need to see. This behemoth stretches for 4,000 miles and was erected to protect the Chinese Empire from invasions, although it’s also used for controlling things like trade and emigration. The wall was first built back in the BC era and lasted for hundreds of years. As each new dynasty took control, changes and improvements were made to strengthen the wall. With these man made wonders located all over the world, it looks like you’ve got a lot of traveling to do. The airfare will be totally worth it once you get to see these amazing structure for yourself, though.